Twenty million years ago ocean covered the area where Panama is today. There was a gap between the continents of North and South America through which the waters of the Atlantic and Pacific Oceans flowed freely. Beneath the surface, two plates of the Earth’s crust were slowly colliding into one another, forcing the Pacific Plate to slide slowly under the Caribbean Plate. The pressure and heat caused by this collision led to the formation of underwater volcanoes, some of which grew tall enough to break the surface of the ocean and form islands as early as 15 million years ago. More and more volcanic islands filled in the area over the next several million years. Meanwhile, the movement of the two tectonic plates was also pushing up the sea floor, eventually forcing some areas above sea level. Scientists believe the formation of the Isthmus of Panama is one of the most important geologic events to happen on Earth in the last 60 million years. 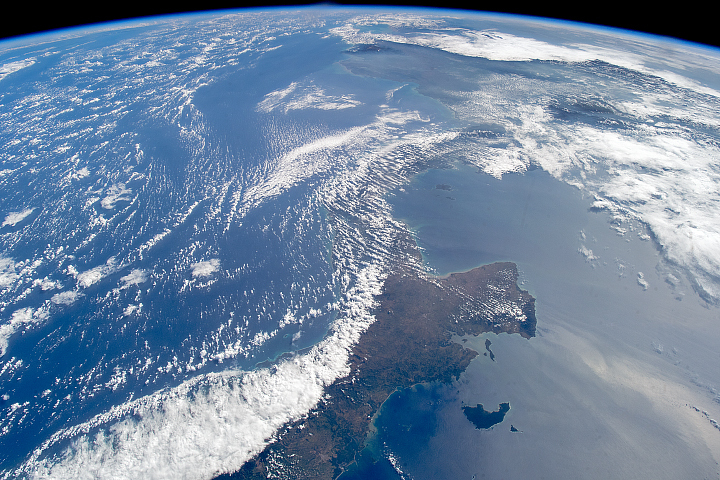 Even though it is only a tiny sliver of land, relative to the sizes of continents, the Isthmus of Panama had an enormous impact on Earth’s climate and its environment. By shutting down the flow of water between the two oceans, the land bridge re-routed currents in both the Atlantic and Pacific Oceans. Atlantic currents were forced northward, and eventually settled into a new current pattern that we call the Gulf Stream today. With warm Caribbean waters flowing toward the northeast Atlantic, the climate of northwestern Europe grew warmer. (Winters there would be as much as 10 degrees C colder in winter without the transport of heat from the Gulf Stream.) The Atlantic, no longer mingling with the Pacific, also grew saltier. Each of these changes helped establish the global ocean circulation pattern we see today. 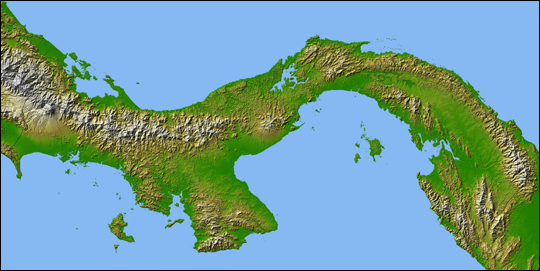 In short, the Isthmus of Panama directly and indirectly influenced ocean and atmospheric circulation patterns, which regulated patterns of rainfall, which in turn sculpted landscapes. The formation of the Isthmus of Panama also played a major role in biodiversity on our world. The bridge made it easier for animals and plants to migrate between the continents. For instance, in North America today, the opossum, armadillo, and porcupine all trace back to ancestors that came across the land bridge from South America. Likewise, the ancestors of bears, cats, dogs, horses, llamas, and raccoons all made the trek south across the isthmus. Scientists made this false-color image of Panama using data acquired in February 2000 by the Shuttle Radar Topography Mission (SRTM), flying aboard the Space Shuttle Endeavor. High-quality satellite imagery of Central America is generally difficult to obtain due to persistent cloud cover in the region. The ability of SRTM to penetrate clouds and make three-dimensional measurements has allowed scientists to produce the first complete high-resolution topographic map of all of Central America. Two visualizations were combined to produce this image of Panama: shading and color coding of topographic height. By computing the topographic slope in the north-south direction, scientists were able to make the shading that gives it its three-dimensional appearance. The colors directly relate to height. Green shows the lowest elevations, just above sea level. Yellows and then tans show progressively higher elevations, with white being the highest.